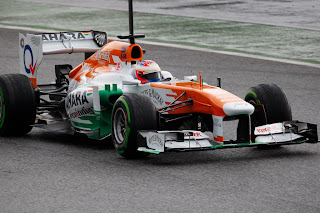 Talking about F1: The F1 blog: F1 2013 Season Preview: Force India - A rising force? F1 2013 Season Preview: Force India - A rising force? Does Force India get the credit it deserves? It is often viewed as a quintessential midfield presence, sometimes so with a dash of derision. But it's easy to forget how far the operation has come in a short space of time. Rewind just to 2008 and the team was considered little more than end of grid fodder. The squad, following from Eddie Jordan's faltering final steps in F1, had stumbled on under the guises of Midland and then Spyker with few signs of progress. And when Vijay Mallya led a consortium to purchase the outfit in 2007 it's fair to say that not many expected the trajectory to change. But change it did; a reshuffle and a McLaren tie-up (complete with McLaren gearbox and Mercedes engine/KERS) later from 2008 through to 2011 Force India's year-on-year final constructors' standings positions read thus: 10th, 9th, 7th and 6th. All the while the team had almost nothing an F1 fan could object to: a proper racing team, making the best of what it had and displaying a rare willingness to give drivers opportunities on merit. And despite appearances the improvement continued in 2012. Even though the team started slowly, seeming tardier than most to understand the potential within the new exhaust positioning and blowing regulations, and slipped back a place in the final constructors' standings thanks in large part to a congested midfield in which most raised their game more than Force India did, the team get stronger as the year progressed and in the end almost doubled its points from the previous year (accumulating 109 compared with 69 from 2011). And of course it might well have won the final round. 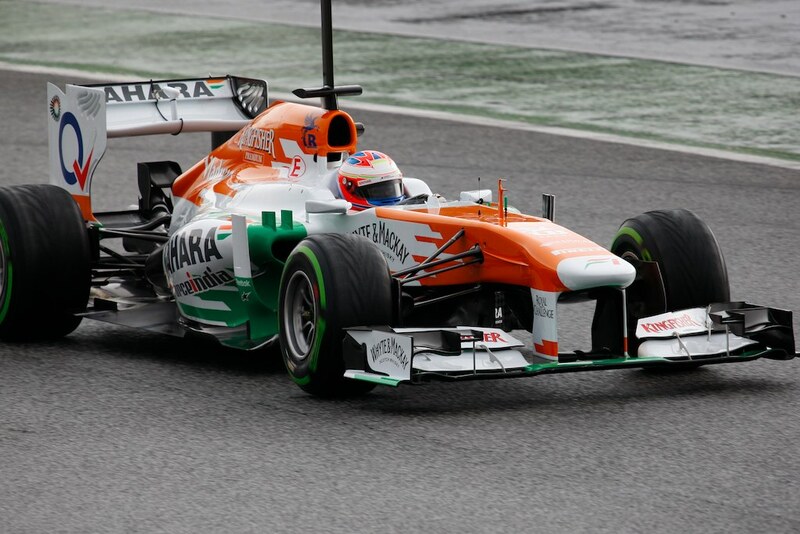 So, things looking good for Force India to step up yet further in 2013? Well, yes and no. The VJM06 looks a good one to observers and is thought to have gone pretty well in testing, seemingly continuing from its strong end to last season. And with that in mind perhaps a podium, or even a win, on a good day can be plundered from 2013. But a few doubts linger menacingly in the background. One is, the team remains less well resourced than most of the rest of the midfield, in staff numbers and - markedly - in terms of development tools. Deputy team principal Bob Fernley has admitted that the team's wind tunnel is '20 years out of date', while its CFD capability is less than Caterham's and it relies on McLaren for a simulator, not having one of its own. Its in-year development seems to be based on hunch rather than on reams of gathered data. While the team can be commended for punching above its weight (and despite everything it's actually improved competitively as each of the past two seasons have progressed), you wonder how close it is to its glass ceiling; how long such over-achievement can be maintained. Can the team invest therefore to get onto the 'next level'? That's where we find the most severe cause for doubt, sadly. Fernley insists the 'next step of investment' is on course, but some of Vijay Mallya's other businesses have been having their troubles in recent times, so there may not be much spare cash around for an expanded F1 effort. And while the mighty Sahara has a stake in the team these days it's not yet clear what its precise role is, and more to the point how much cash it is prepared to stump up. And for all the team puts a brave face on it all, that it took so long (until a matter of days before everyone flew out to Melbourne) to name the occupant of its second race seat alongside Paul Di Resta gives the game away possibly. Such a late decision can only be explained by finance, trying to force (pardon the pun) the deal that was most financially advantageous, rather than by assessing the competing driving merits of the two contenders. Of course, none of us outside a select few in the highest echelons of the team know the precise situation, and the rest of us wish the team all the best on this front of course. But on track at the very least, more of the same from Force India in 2013 is far from a bad thing. He needs a big season, does Paul. Possibly more than just about any other driver out there. 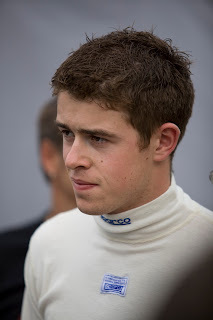 Paul Di Resta arrived in F1 in 2011 - from DTM, not the most likely route - and impressed everyone with his Jenson Button-like smooth, safe and above all pretty rapid drives. Mercedes, McLaren, even Ferrari, were reckoned to be monitoring his progress. But as is F1's way things never stand still for long, and 12 months on his previously glowing reputation is running the risk of beginning to look a little tatty. In early 2012 things looked to be continuing from 2011's trend line, as swiftly Di Resta took the whip hand in his intra-team battle with Nico Hulkenberg: he was 5-1 up on race results after six races, as well as 5-2 up in qualifying after seven. Even as the Hulk improved as the year went on Di Resta still was broadly giving as good as got, and it was topped off by a career best, and highly impressive, fourth place finish in Singapore. But at that very point Di Resta's campaign unravelled quickly. First of all the Mercedes and McLaren seats that he fancied occupying for 2013 closed off within hours of each other, and coincidentally or otherwise Di Resta's driving lost something. Di Resta himself attributed it to 'chassis problems', the team thought that Hulkenberg's aggressive style was getting more out of the Pirellis at that point of the year. But whatever the case, Di Resta was routed in the year's closing races and it didn't look good. It also gave rise to the possibility that, again a bit like Button, he needs everything to be just so underneath him in order to give his very best, and is perhaps spooked unduly by technical imperfections. Di Resta however could not ask for a better platform on which to impress in 2013: he's had a winter in which to reflect and to focus, his team mate has been confirmed late which must surely give him an advantage in preparation, and the Force India looks a good one, capable of troubling the top order on occasion. But you feel that this is the year that Di Resta must step up. If he ends up behind his team mate on points for the third year out of three then many may make their minds up about him, and not in a positive way. So finally after weeks of prevarication, Force India decided to go back to the future. Adrian Sutil, formerly of this parish from 2007 to 2011 (as well as 2006 as a test driver), returns to claim the team's remaining 2013 race seat in preference to the younger option of Jules Bianchi. The decision didn't meet with universal approval, but beyond the surface there was some justification, even ignoring the shenanigans on money, engines and technical tie-ins which most likely framed the selection. Sutil has the benefit of being the safe option of the two; while Bianchi has shown flashes of talent on his way up the ladder there have also been conspicuous troughs as well as some errors, and the Force India team admitted that all things being equal it felt Bianchi could have done with another year of experience-gathering in 2013 before getting to race. But Sutil also has plenty of qualifications of his own. While in his early days in F1 he was raw and unpredictable as well as good for a few accidents, rather like his team his year-on-year improvement was marked. And in the latter half of 2011 he was driving superbly, with the big finish of a great run to sixth place in the season-ending round in Brazil which helped him to ninth place in the final drivers' standings. Immediately though F1 turned its back on him, mainly due to a couple of factors: one is at Force India he ended up in a three-into-two-won't-go situation with Di Resta and Nico Hulkenberg for the 2012 drives, which not many drivers would win out in. And, oh yes, he was facing charges for GBH, which in early 2012 turned into a conviction and a suspended prison sentence. This was significant apparently in him missing out on 2012 seats elsewhere. Many are troubled by Sutil's return for this reason, but I for one am glad to see him back; I'm a believer generally in second chances and seeking to punish Sutil for ever will achieve nothing. And if nothing else we should know by now that getting moralistic about F1 and its participants would set us on a slippery slope. Most pointedly, while clearly Sutil will never be an Alonso he is a handy F1 driver with a good turn of speed, and on merit behind the wheel is worthy of his place in the top 22. Based purely on his driving, it was a travesty that he was dropped by the sport in the first place.